Following a sports injury over 40 years ago that included a ruptured ACL and extensive damage and removal of all knee cartilage I was left with a bone on bone knee joint for this span of time. I’m a active person and got to point last fall where severe knee pain was creating a major life style change. After injections of anabolic steroids and a synthetic joint lubricant I was referred to Proof PT and they’ve helped me get back to doing the things I love to do! Over this past year I worked with several of the staff of Proof PT but was primarily supported by Jordon during my PT treatment. Following this treatment program I’m truly amazed at the return of function, strength and flexibility. I believe that the treatment provided was very effective and has postponed knee replacement surgery for years. I would highly recommend Jordon and the entire staff of Proof PT. This is a great group of therapists in a very cool location, close to downtown and easy to park. I had heard good things when I went in last November to try to get relief from hip pain that I had been experiencing for 2 years. Jordan did some therapy and put me on a program, and I felt better immediately. 2 months later I was pain free. I have sent members of my masters swim group to Proof with similar results. 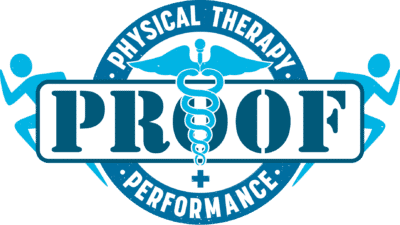 Thanks, Jordan and the Proof PT Team! The team here is pretty dang awesome! I came in because of some neck/back issues, but mostly because my right leg was going numb and I had no idea why. My chiropractic adjustments alone weren’t cutting it, (although, I love my chiro), but I went in to see Jordan. He’s awesome, and so are all the interns that work there as well. I saw an improvement within a few weeks, and just finished my treatment… My leg is almost as good as new! I have to admit I’m a little surprised…I had no idea that physical therapy would actually help, and seriously thought it was only for people recovering from surgeries/accidents. Great team, and great results! I went to Proof PT to rehab my shoulder, which I had broken and had surgically repaired 6 weeks prior. During my initial assessment, Jordan inquired if I had any other injuries. Well, I’m over 50 and enjoy distance running, so yeah! He told me he’d address everything. Wow! I wasn’t expecting that, and he was true to his word. After just 11 weeks, my shoulder has gained almost 100% range of motion back, I’ve learned how to address my lower back issues myself, and my foot no longer hurts AT ALL (after a diagnosis of PF 2 years prior, treatment by 2 other PT’s and custom orthotics from a podiatrist). I’d give 10 stars if I could!